When it comes to forensic investigations, it’s essential that you work with a partner that has years of experience and knowledge actively assisting clients in this critical area. 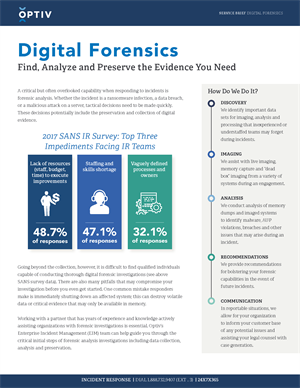 Optiv’s Enterprise Incident Management (EIM) team helps guide you through the initial steps of the forensic analysis investigations process---from data collection, to analysis and preservation. Optiv’s experts work side-by-side with your team members to ensure proper handling and storage of evidence, recovery of volatile data, documentation, and coordination between technical and legal teams.